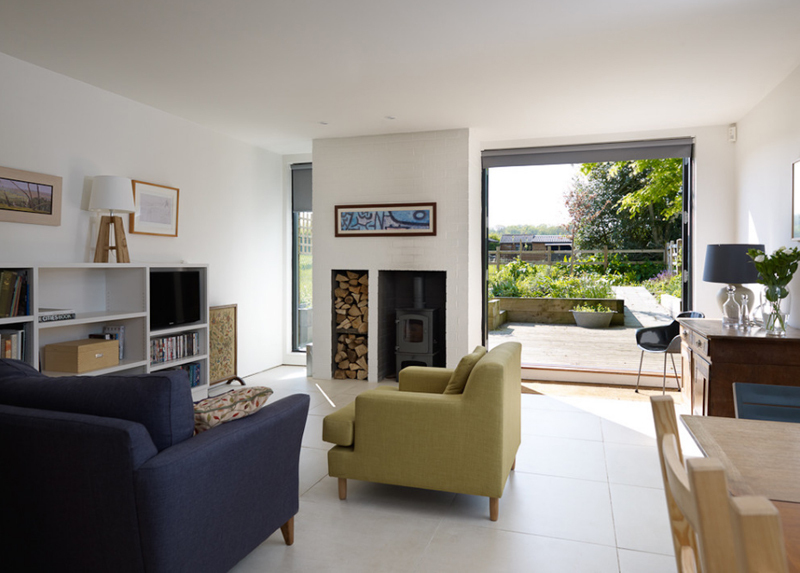 Here are ideas on how to add a freestanding fireplace in your home. While researching about cool and unique designs of fireplaces, I came across freestanding wood stoves which are appliances that people in years past used as a fireplace. If you search the internet for these appliances, you’ll see that some of these stoves are inside a fireplace while others are actually as it is called, a freestanding wood stove. 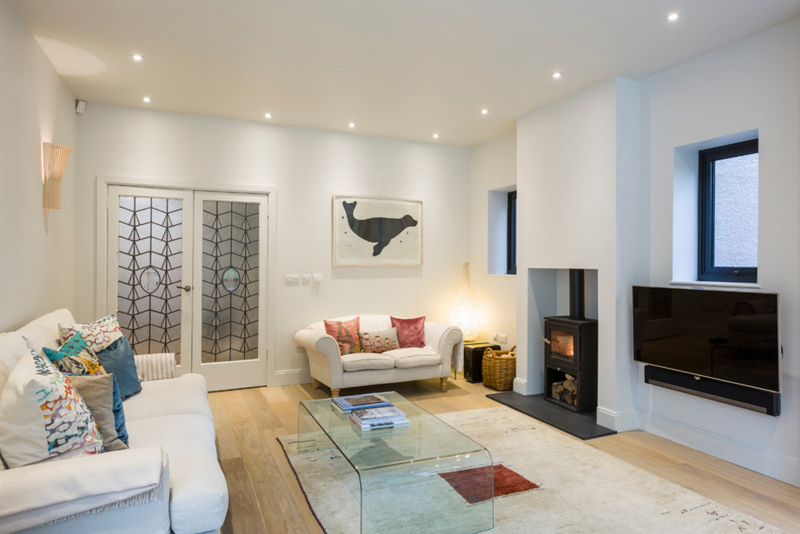 This type of a wood burning fireplace could actually be placed anywhere in the house to be able to facilitate the flow of heat as long as the requirements for combustibles are observed; things like these are checked by housing officials for permits. If you are interested in achieving a bit of rustic feel to your living room and needs a fireplace, you should consider this freestanding wood burning stoves as alternative for an entire fireplace, with that, check out the list that we have below about 20 Awesome Freestanding and Wood Burning Fireplace. 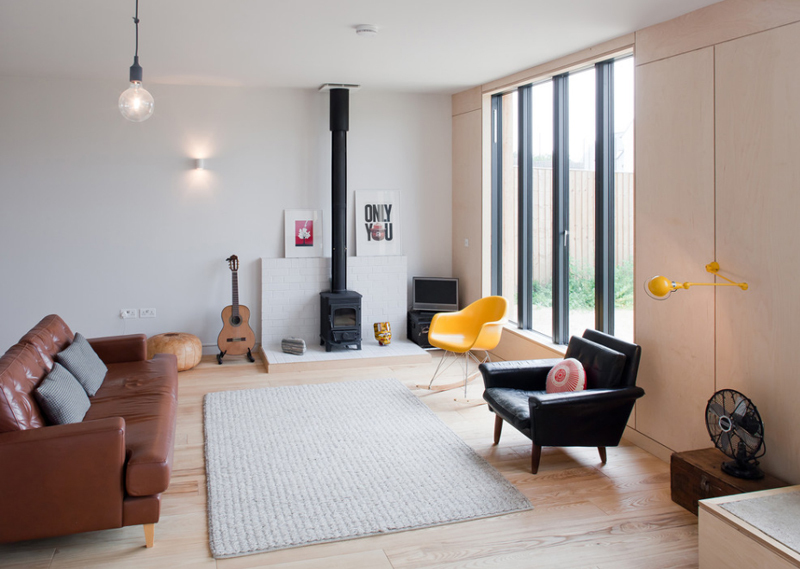 I chose to place this photo to be in the beginning of the list because it has the most vintage design of a free standing wood burning stove that this list have. I also want you guys to actually check the vintage table and chair combo beside it. Who says you can’t work at home in style? 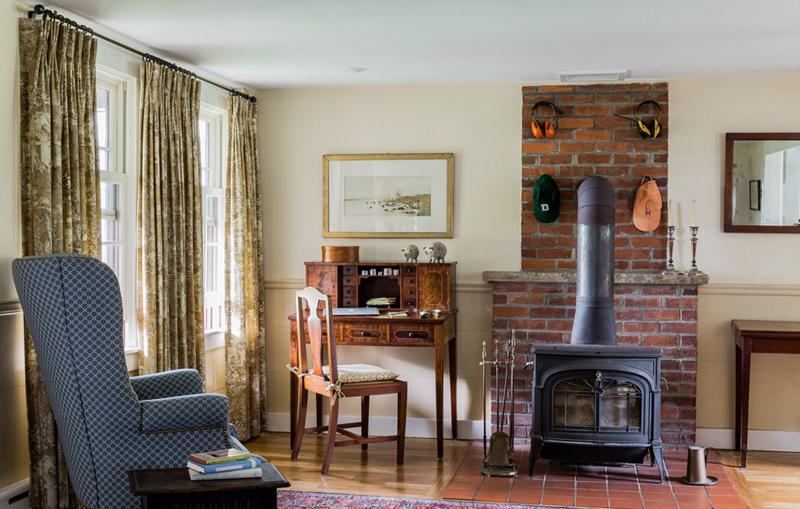 The photos of this home is one of the houses that look at before because of how interesting the entire house is, and now, I am given the chance to actually share it with you because of the beautiful freestanding wood burning stove that it has. I think this area needs more seating but the large bean bags seem to compensate well for the needed seating this living room needs. 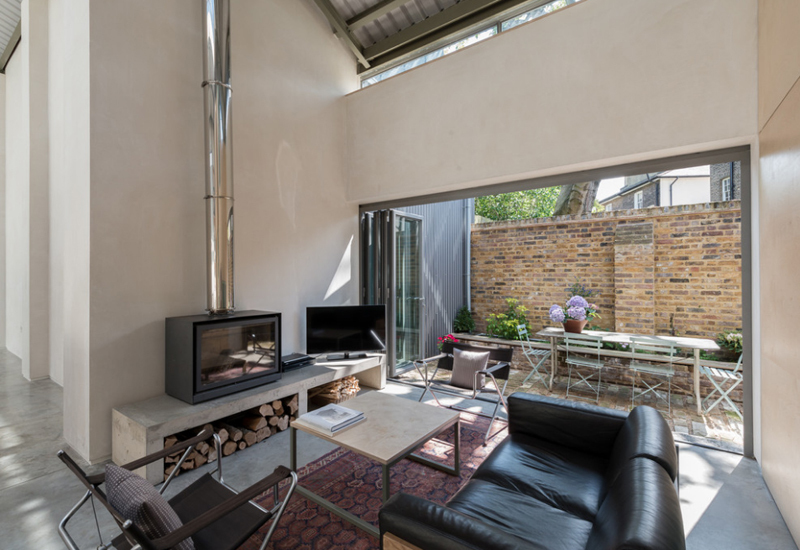 This home in Broadgates road sure looks incredible! The color of the couches is definitely my favorite along with the choice of pillows that they added to it. It may not seem to be in the middle of the couches, but I think that the fireplace sure looks like it’s in the most ideal place. I know that the view of the outdoors is quite a treat, but I think if this was a beach, the glass windows needed to be open! The seating that they prepared was made sure to really face the glass windows and I think that it’s terrific! An almost all-wood and glass home is presented to us through this living room and I would like to really admire the coffee table seen here! Of course the fireplace is the center of attention here, but can you blame me for admiring the unique coffee table? Here is an example of a freestanding wood stove that is not all-black; notice that the base is like a light grey and the tube where the smoke passes is in silver! I think that this color combination for the fireplace is really nice and it sure is the center of attention of this living room. 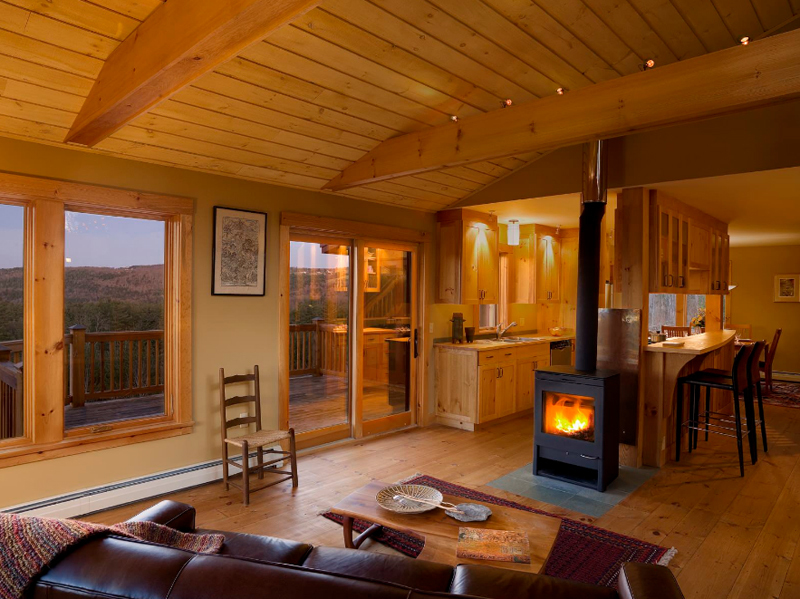 This is one beautiful contemporary mountain home and adding a vintage looking wood burning stove created a transitional look and feel to the entire space. 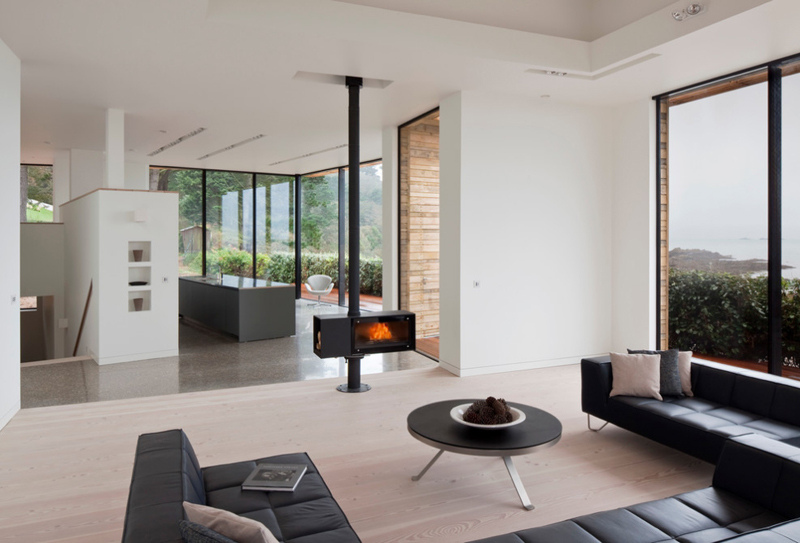 Imagine if it was a contemporary designed fireplace – it think the look would be different, but since they used mid-century modern furniture, it’s just right that they used this type of fireplace. I remembered that freestanding wood stoves should be placed above a non-combustible thing and I think that placing it in a brick based counter is not a bad thing. It looks like it actually belongs on that table, plus this base help it to actually ‘stand’. 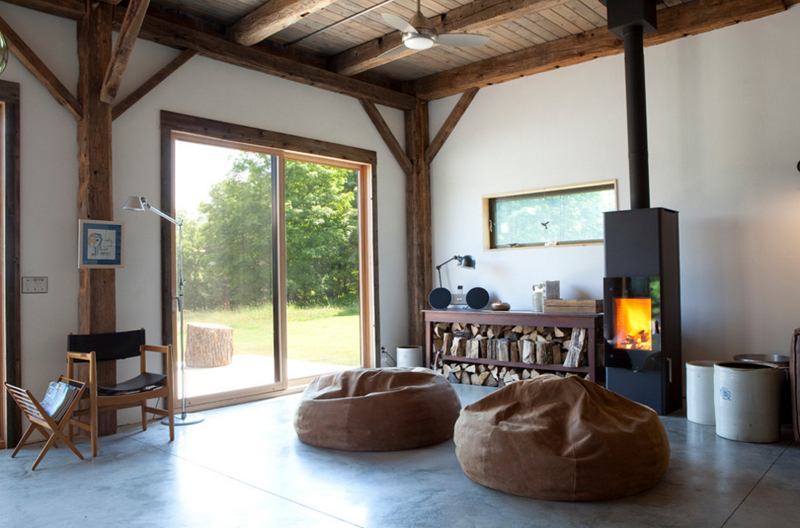 What do you think about the cool look and design that this wood stove have? of course its color match with that of the sectional and the coffee table and it looks like a rare design too! Neutral shades for the back ground and black for the accents – pretty awesome! This freestanding wood burning stove is really pretty! It has a beige color that contrasts with the color of the bricks in which this stove is actually connected to. Adding a pink love seat on the side created a more feminine feel to this space. 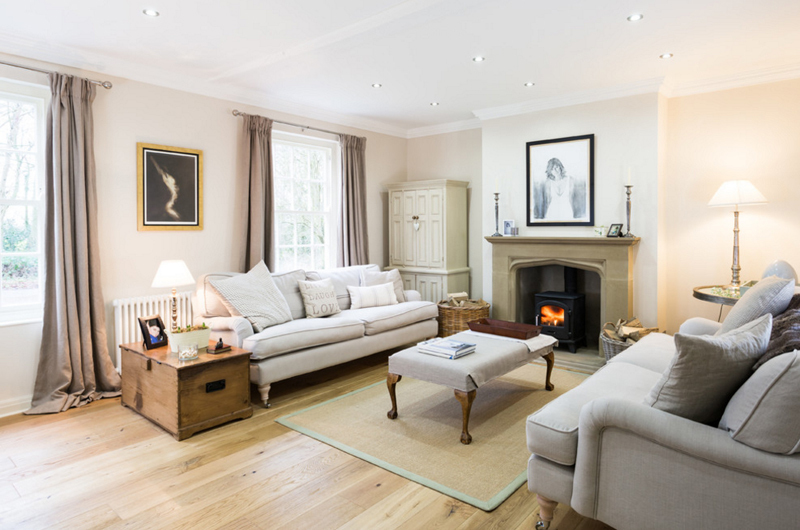 This is one large living room with minimal seating and decorations – or at least, this living room actually has less of everything but more on the space. 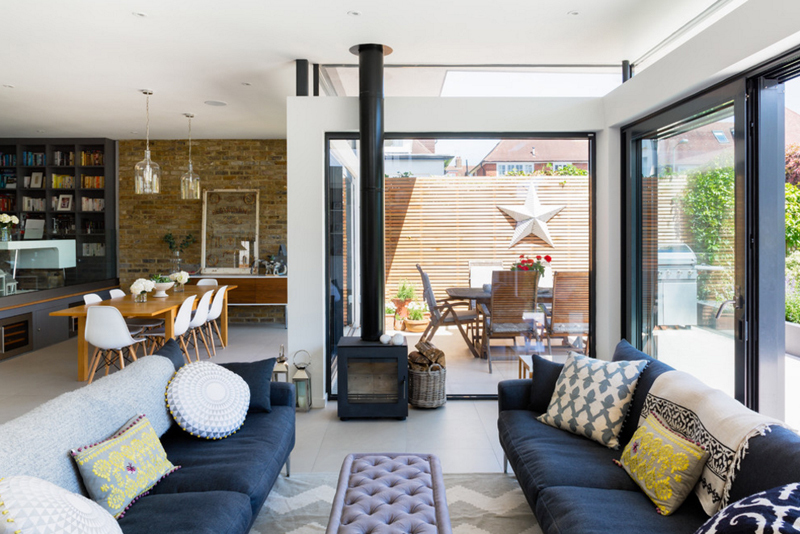 I love the long windows on the wall and the different choices of arm chairs and couch inside this space. Is that a seal on the wall? It sure looks like it! It surely creates a different feel for this space because if you notice, it’s basically the only decor in this space aside from the colorful pillows on the couches. Imagine if the seal photo on the wall was not in its place? Wouldn’t the entire living rooms’ look and aura change too? 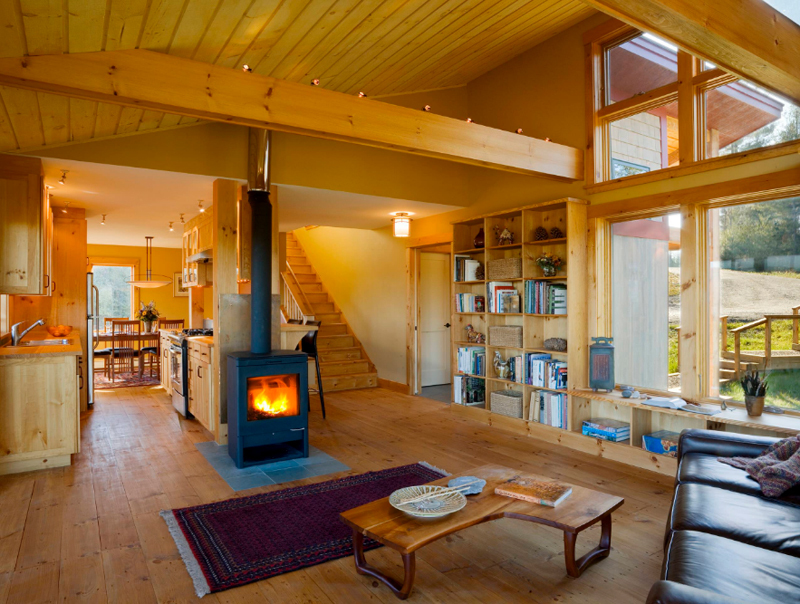 Look at the tiny freestanding wood stove inside the fireplace! I think this design is real nice for tiny spaces that wants and needs a fireplace. What I like about this small seating area is the bookshelf on the left side because of the different sizes of the cubby holes in it. Here is one sample of a home wherein it is not really much of a cabin even when it has exposed wooden beams and all that. The design of the living area is idea for humid countries that the pieces of furniture inside this space is quite colorful and fun! I know that calling a house a sanctuary is a cliché because we all know that it’s actually true, so, there is no need of actually call one specific house that; but anyway, this house sure looks like this could be a great place for escape – the look of the interiors seems to homey and comfortable and the view of the outdoors is just divine! Noticed how much wooden homes or cabins are in this list? 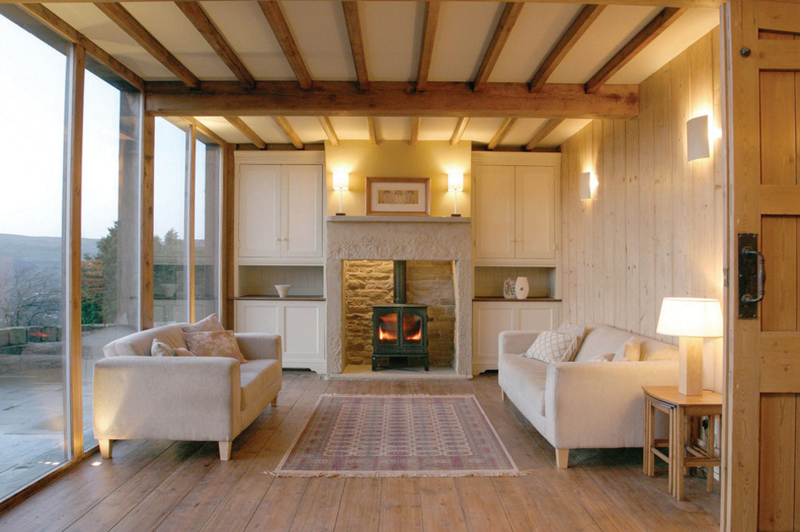 Because most often than not, the use of freestanding wood stoves are usual or common for rustic homes than other styles. How would you feel if you actually lived in a houseboat? I think that it would really be interesting. 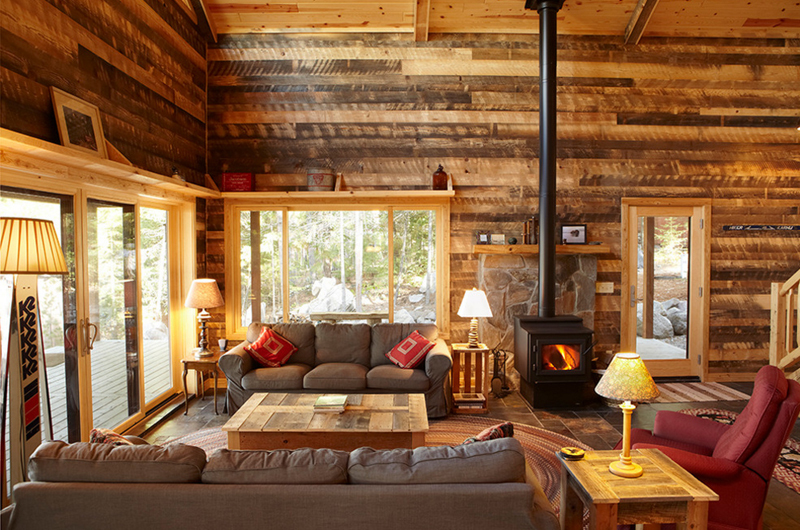 The cabin look of this home is really fascinating. 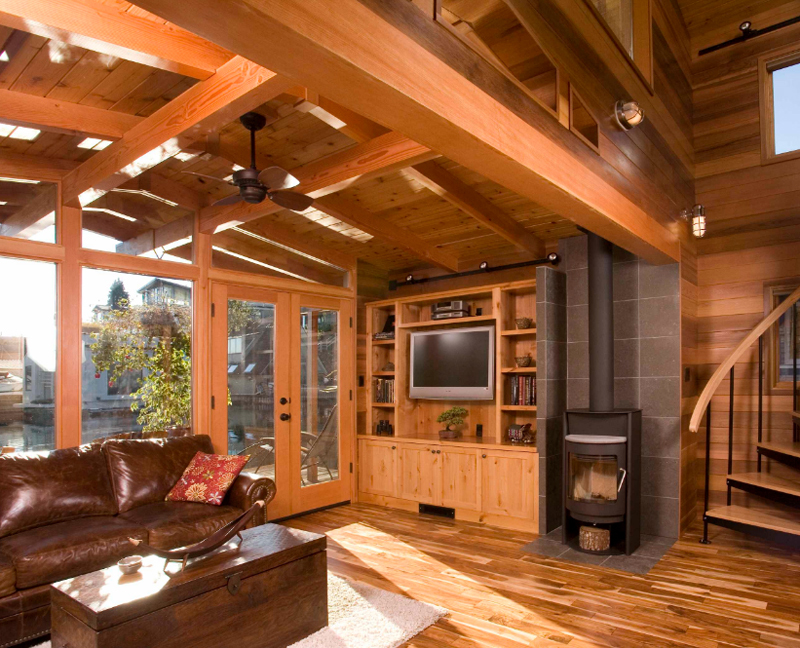 The color of the wood that surrounds this living room is just wonderful, you feel how earthy this space actually and it seems like a comforting idea. 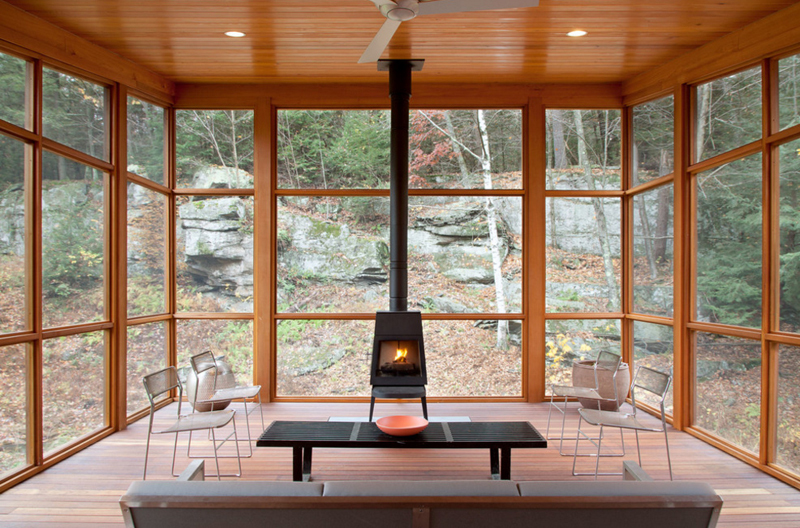 The furniture chosen looks comfortable and the freestanding wood stove is just perfect! 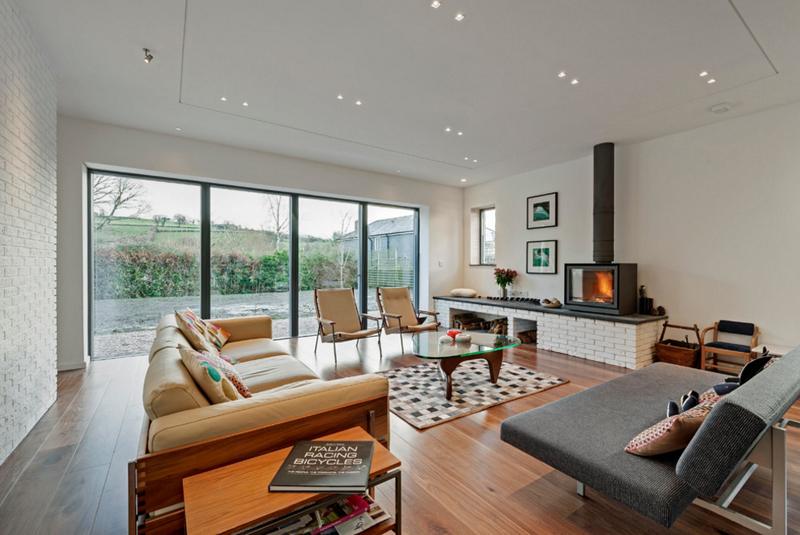 Look at how symmetrical this living room looks! 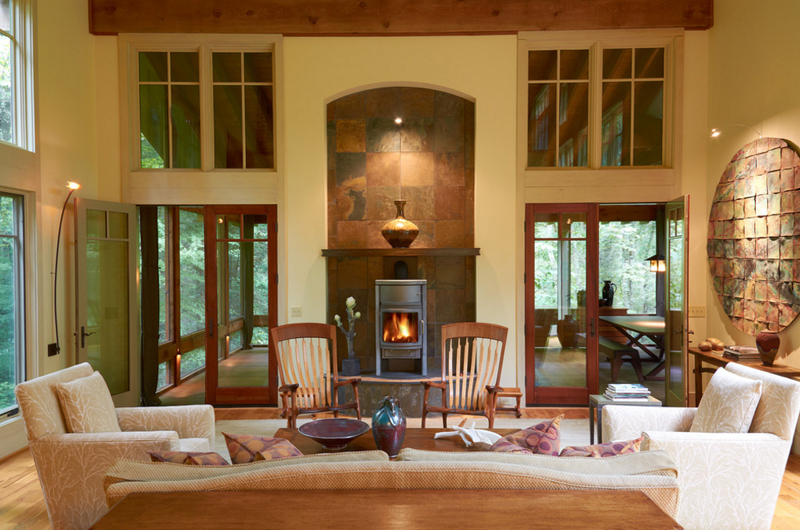 I mean, the couch beside the window does not really have a side table and lamp but from the cabinets on the each side of the fireplace to the couches and the way this space is actually divided, at one glance, you know it’s symmetrical. 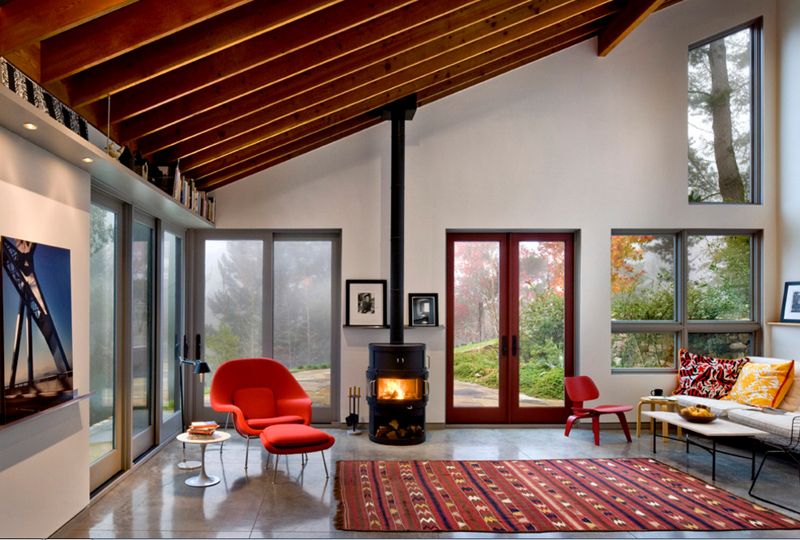 I like the color of the freestanding wood burning stove that this fireplace have. From a distance I think it somehow looks like it’s pink or something – but then again, it’s actually safe to say that this is white and it was chosen to really blend with the color of the entire living room. 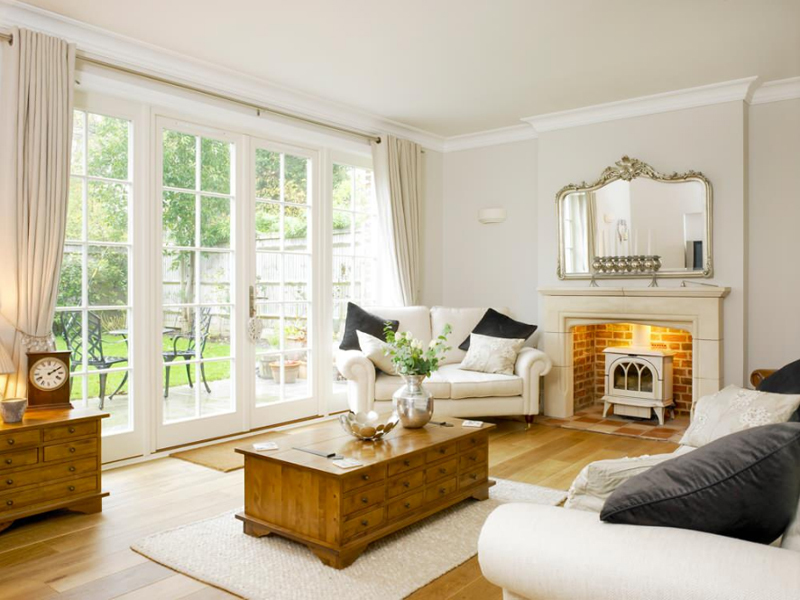 This list is ended by a cottage home with a comfortable and homey looking living room. 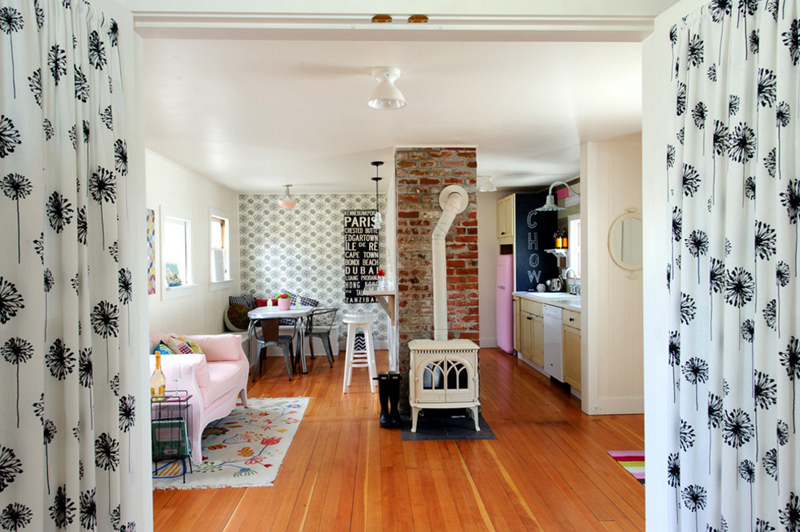 The color scheme used in this space is a simple one but sure is neat and fab! Looking at the colors of the couches and the coffee table, we can say that they could be a set when they were bought. When I came across the first photo I got when I was completing this list, I thought that only old houses used or had this type of fireplace, but if you noticed, there are more modern and more sleek designs of these freestanding wood burning stoves in today’s homes too; but if you want a more contemporary or modern fireplace designs, check out the 20 Suspended Fireplace Designs in the Living Room and maybe pick a favorite and maybe that’s something that you can actually add to your home!